Today has been a pretty relaxing day for me.. I set off about 11am from Ardmore wood on Mull with the destination of Glencoe in mind. It's a place I've visited many times before, but I've never taken this route before, and looking over the road atlas, it looked to be a good one. I drove along the road from Tobermory to Salen - the thought crossed my mind that this is probably the busiest road on the island, and it had two lanes going in opposite directions, (well, as opposed to single track with passing places), but, after a while it returned to a single track road, albeit with a better surface. I arrived at the ferry at Fishnish, doesn't that name make you hungry? 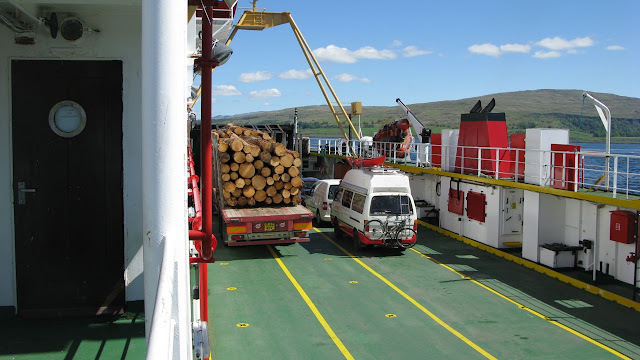 It was a short crossing to Lochaline, but was as exilerating as most sea crossings are with the fresh breeze and sea spray, a double trailer of timber was taking up one side of the deck. 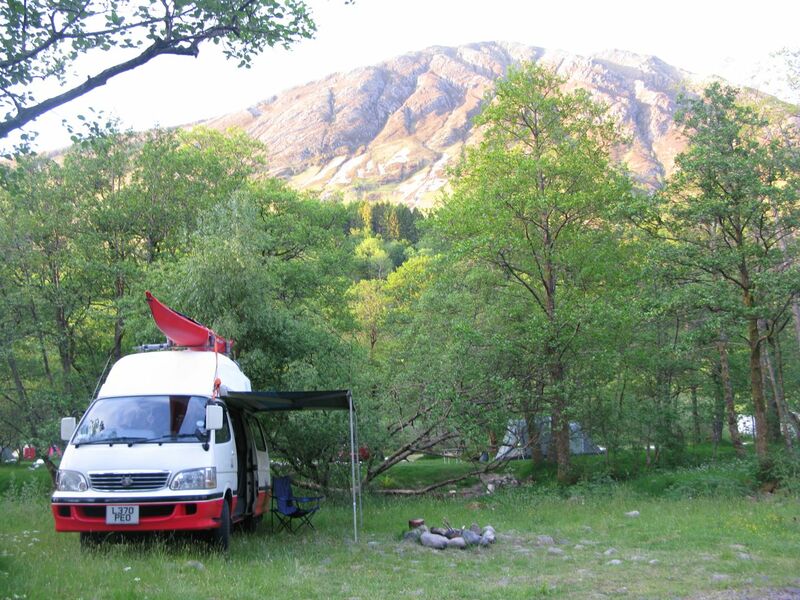 Once on the other side there was only about 30 miles to go to get to the next ferry at Ardour, and it was another beautiful drive through highland scenery, trees and bluebells as I rattled along the single track, the van dropping into lower gears as I climbed the steeper sections. On eventually reaching the coast again the view was yet again incredible - before me I could see Ben Nevis, still capped in snow, and the mountains at Glencoe just off to the right.. 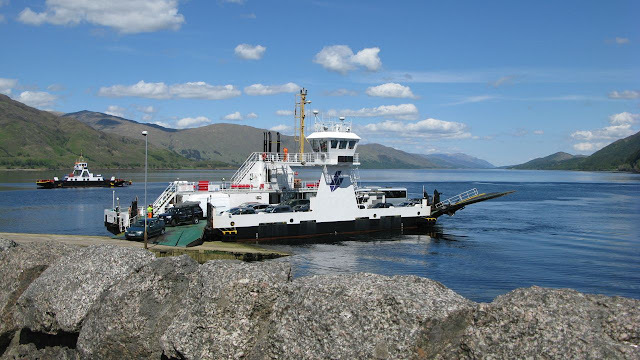 The ferry from Ardour to Corran was literally a five min hop and under a tenner too. 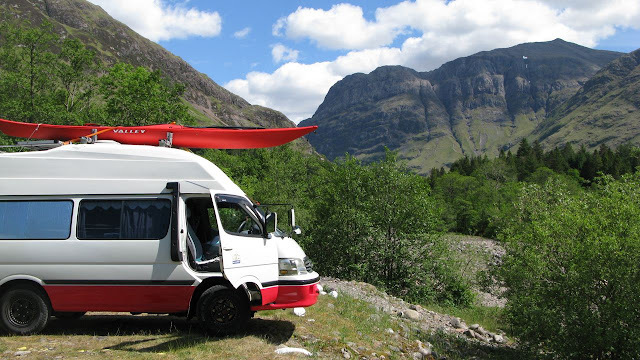 I was getting into the busier routes of the highlands summer season now and it's always amazing to check out some of the unique camper vans, Landrovers, and vehicles with canoes and kayaks on the roof. On driving off the craft, I was on familiar shores and it was only a short cruise round the loch and over the bridge and I was driving into Glencoe village, with the mountains towering above it. I established an awesome campsite by a fire pit, rolled out the awning, and chilled out in the shade a while, but all the while heard some Scots having a laugh in the pool in the river next to the campsite - it was time for some more wild swimming shenanigans! I headed over to the pool, 'heh' I said, 'hows the water?' Following the example of one of the guys there I plunged into the cool water and felt all the heat of the journey leave my body and my arrival in Glencoe was complete. There's no more effective way to acclimatise to a place than to swim in its waters - it's grounding and direct, no messing about. It felt good to be on my bike again, peddling up the hill on the narrow road towards the summits beyond. The weather was unbelievable and the breeze warm yet refreshing, and I kept pulling in at the roadside to gaze up at the peaks now surrounding me. I followed the road up the the main roadway through the valley, then coasted down a riverside trail back to the Clachaig Inn. Then I sped down the hill through the trees by the river, through Glencoe village onto the shores of Kinlochleven. There I lay in the sun on a bench, enjoying the evening heat.. 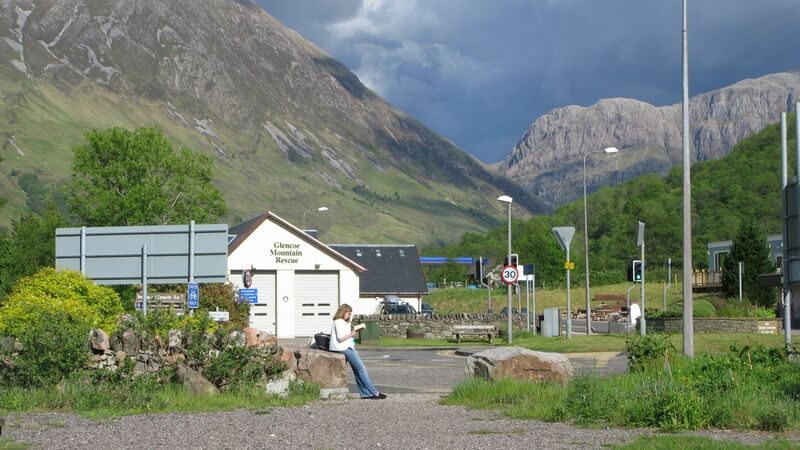 I'm now sitting in the Clachaig Inn having a pint, having had a highland venison burger with chips. A hungry, doe eyed dog watched me eat the whole thing, from under a bar stool, while his master waited for their food..
Tonights camping spot - it doesn't get much better than this - well it does! See you soon..